That didn’t take long. We had heard that Zenefits cofounder and former CEO Parker Conrad had an idea for a new startup but now it seems he’s already on the hunt to hire the company’s first engineer employee. This according to a short-lived help-wanted ad posted to Hacker News, spotted by the Wall Street Journal. The ad comes as Conrad’s former company, where he still has many loyal employees, is going through another rounds of layoffs and its current CEO David Sacks is also asking employees to quit on their own with a voluntary separation package. To be fair, there are a lot of employees at Zenefits who are not his fans, either, they have told us. That’s because Conrad was a controversial CEO at Zenefits, a company he founded that offers HR software and insurance brokerage services. He was forced to resign in February when the company came under investigation by several states for selling insurance without a licence. In its first two years, the company grew wildly, raising a whopping $583 million at a $4.5 billion valuation. The company then began to hire wildly and spun out of control. It also became known for a hard-driving culture that encouraged employees to work long hours, take shortcuts and party. When Conrad left, COO Sacks took over as CEO and he’s spent the past few months cleaning up the company’s licence compliance problems, changing the corporate culture (banning drinking at the office, for instance), laying off workers, reorganising the staff and telling the world to stop comparing Zenefits to another famously high-flying crashed startup, Theranos. Sacks has a long history of running successful startups, and he’s been very open and public about the changes he’s making at Zenefits. 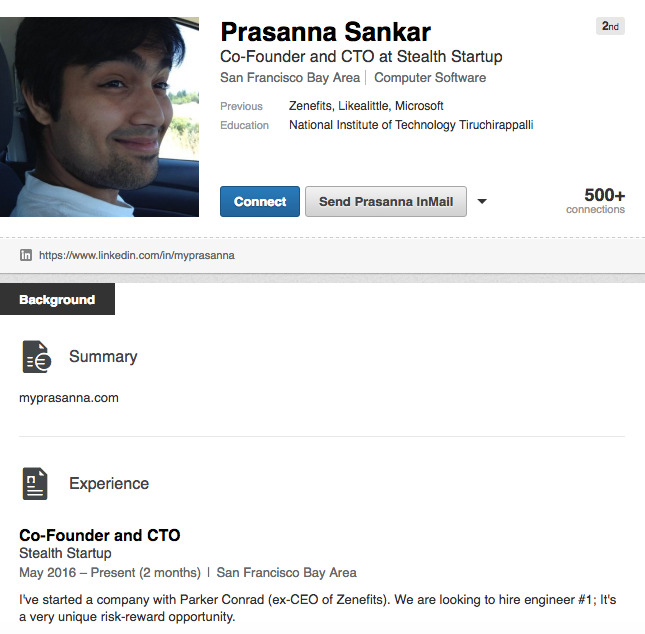 Details are slim as to what Conrad’s new startup is up to, but he already has an engineer cofounder, a former Zenefits employee named Prasanna Sankar, according to Sankar’s LinkedIn profile. Sankar interned at Google, did a short stint a Microsoft before spending four years trying to launch a startup called LikeALittle, a social network for college students. At Zenefits, Sankar worked on Zenefits payroll system, according to his LinkedIn profile. That was a major new product for Zenefits after Conrad had a much publicized spat with the CEO of payroll giant ADP. The new startup apparently has a third co-founder, the ad said. They are looking for a “technical ex-founder” to join them, indicating they want a person who, like Conrad and Sankar, has already been around the startup block at least once. As we previously reported, when Conrad left Zenefits he walked with a sizeable payout, a source close to the situation told us, enough for him to self-fund a new venture if he wanted to: he made more than $10 million. 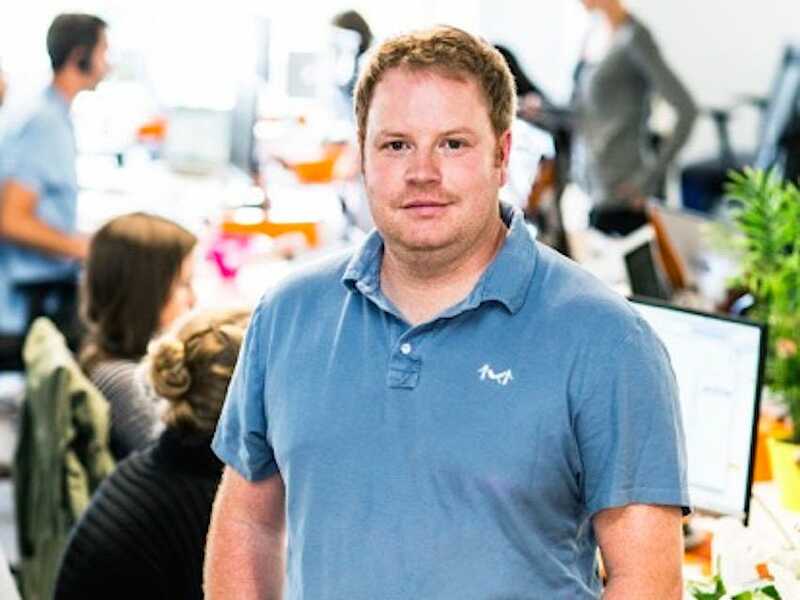 Prior to starting Zenefits Conrad’s life was a roller coaster too, including being “fired” from the previous startup he cofounded (his words), almost flunking out of Harvard, secretly living in an old people’s retirement home and fighting off cancer. He started Zenefits when he was pretty much broke.